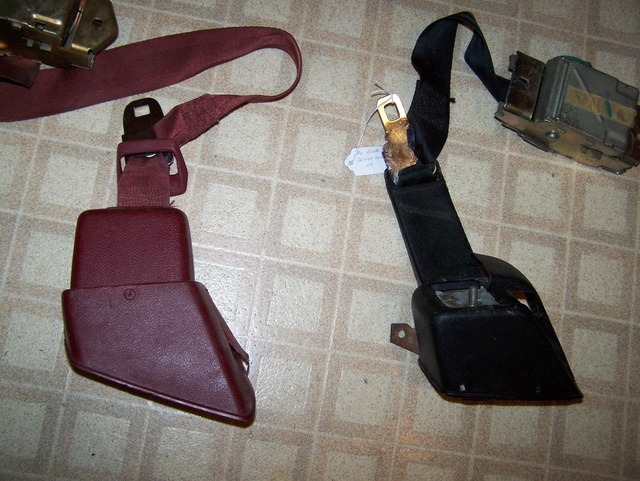 For what it's worth, the bench seat belt retractor (male) is the same, just the centre pieces would be different? I might still have the ones from my bench, they are black. I'll look tomorrow after work and let you . . .
if you could that would be great. Dinomyte wrote: For what it's worth, the bench seat belt retractor (male) is the same, just the centre pieces would be different? I might still have the ones from my bench, they are black. I'll look tomorrow after work and let you . . . This is correct regarding the bench/bucket outer belts...but, be aware that there were several styles/shapes of male buckles used on bench seats and each requires their own corresponding female inner receiver belts to work. They are not interchangeable. And, the correct inner belt for buckets was a single, taller belt that was encased in a plastic sleeve so it would stand upright alongside the seat. I've only seen one style used on G.P's and Chevys with buckets (Olds had a second style in '77)...IF, you're looking for the correct belts. Here is a photo showing two common styles in bucket vs bench. The red swivel belt retractor shows the male buckle you'd need if you wanted the correct inner belt. The black retractor is typical of a bench belt limiting you to the improper (albeit, still functional) bench-style inner belts. i think i rather stick with the proper style. i really just need them for the seat mount honestly. it would just be a bonus and less of a hassle if they are complete. Steve is absolutely correct, he's the one that got me my set of swivel bucket belts (the red one above) the right one is the bench / non-swivel bucket. No worries I"ll go up in the loft on the weekend and see what I can find. I can't find the belts in the loft, sorry. » Rzr seats and some Teryx stuff.